In 2012 I went to Idaho, visited a bunch of wineries and wrote a comprehensive story for Palate Press. I am bullish on Idaho, and I am not alone: wine climatologist Greg Jones says it's one of the regions he expects to benefit most from global warming. There's little inherent reason the wines here can't be as good as those across the state line in Washington. What has held Idaho back is culture and history. This isn't a state where everybody listens to scientists. After a period of rapid growth for the Idaho wine industry, there's a bit of a breather right now. While Idaho has 51 wineries, there are actually fewer acres of vines -- about 1300 -- planted in the state than 3 years ago. There are 26 counties in California with more vines than that. Monterey County, to name just one, has 35 times as many planted acres as the state of Idaho. For Idaho, a little winnowing is not necessarily a bad thing. A lot of older vineyards in Idaho were planted by farmers as an additional crop and weren't being taken seriously. Any new plantings probably will be. Recently I got a case of 12 wines from the Idaho Wine Commission. A dozen wines seems like a lot, but it's not really: on my visit to Idaho I tasted more than 75. A little inside baseball: I frequently get emails from PR people who say, "Would you like to write about (wine region)? I can send you 4 wines." Some bloggers do it, but I never feel like I have enough context. Here, I'm just going to write about the wines I received, but at least I have the background of having been there. Can't wait until my next visit. We had dinner with these wines, twice, and it really affected my ratings of them. Imagine if Robert Parker did that. This wasn't originally my favorite wine in the tasting. But after two meals with these wines, this bottle was the second-closest to empty. It's a light bodied, lively, red-fruit wine that reminds me of how the original wave of Argentine Malbecs charmed America before rolling out the heavy oak. Its savory notes did well with food. 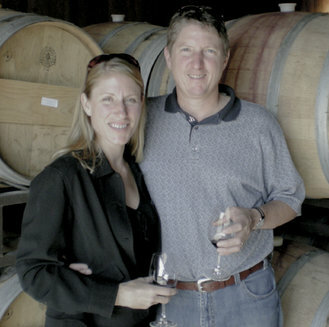 Owner Tim Harless is a commercial airline pilot who named his vineyards in Sunnyslope after his great-grandfather's cattle ranch in Wyoming. This wine is from Hat Ranch's first vintage. Stay subtle, Tim! Considering that most of the wine in Idaho comes from Snake River Valley, the owners of this winery made a smart move in 2000 when they named it. It's like calling your winery Napa Valley Winery. In plenty of regions somebody does do that (Stags Leap has two!). Anyway, this was overall my favorite wine, and in an upset, my wife's favorite as well, because she doesn't like Rhone red blends as much as I do. It's earthy on the nose, with dark fruit on the palate with savory notes and good freshness. It's complex and well-balanced, not a loud screaming wine, but that makes it even better with food. I'd call it a 90-pointer-plus. Buy it here. Ste Chapelle is easily Idaho's largest winery, at 130,000 cases, and it's best known for Riesling. The good news about that is that because Ste Chapelle has so many grapes to choose from, when you pay just a couple extra bucks (the entry level is $10), you can get an amazing value. I was astonished by the quality of an $11 reserve Chardonnay when I was in Idaho 3 years ago, and today I'm amazed that this is just $12. It's a very well-made version of the sweeter style, with good stone fruit flavors, and it's fine with spicy food. If this wine was made in New York it would cost double and be worth it. 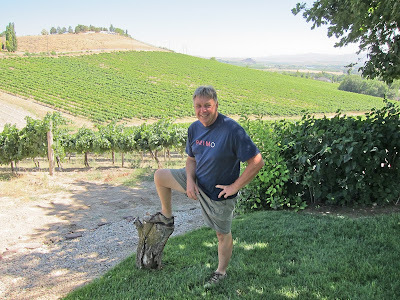 Ron Bitner was one of my favorite vintners in Idaho, a scientist who studies leafcutter bees and planted his Snake River Valley vineyard in 1981, long before almost everyone else. Bitner worked for 10 years with bees in Australia and learned to love dry Riesling. Heck, who doesn't? This is a fine dinner wine and a very representative Riesling: There's a little petrol on the nose, good freshness and it's lemony on the finish. Like Ste Chapelle, Sawtooth is owned by Washington-based Precept Wines, and it's the state's 2nd largest winery despite making a modest 15,000 cases. Precept may have been interested in buying Sawtooth because it came with the state's largest (300 acres), best planted and best managed vineyard. The fruit is top quality, but Sawtooth's winemaking is on the populist conservative side, which when you consider the region ... anyway, this bottle is so heavy it should be registered as a weapon. The wine is pretty solid and heavy as well, with good dark fruit and decent balance. It stands up well to the Argentine models and, from the case I received, was the steak lover's Idaho wine. Buy it here. Most of Idaho's wineries are near Boise or the Sunnyslope region to the west, but Clearwater Canyon is in Lewiston, about 200 km north. The winery was founded on the idea of buying grapes from just over the state line in Washington, and still does. I'm not sure how this wine has an Idaho appellation, as half the fruit comes from the Rock 'n J Vineyard, which, while it's in the proposed multi-state Lewis-Clark Valley AVA, has an address on the Washington side. When I just tasted the wines, this was my favorite: just what I think I want from a Merlot, with gentle black fruit and smooth tannins for a seamless drinking experience. There's a difference between tasting and drinking, though, and with dinner it was a little boring. Still, it's a nice glass of Merlot if that's what you're having. This and the Sawtooth Malbec are the best choices for big fruit fans.